Prof. (Dr.) Om Prie Srivastava has been associated with teaching since 1970. She has guided several researchers in Political Science and Public Administration. She has retired as Head, Political Science and was also Dean Faculty .of Social Science, Mahatma Gandhi Kashi Vidyapith University. She has been a member of many academic organizations and is also a Founding member of World Peace Association, Wales. She has been to England, France, Germany, Switzerland, Poland, and Netherland for academic pursuits. She has written books on Indian Politics, Organization Theory, Public Administration, and Management. She has a large number of papers to her credit in leading journals in India and abroad. The Bhagavad Gita is an ancient text that thates back to the time when the Vedas and the religious scriptures came into being_ Today, in the 21st century, when the world is torn with wars and conflicts, it's time to travel back and seek the 'peace' mantra for the betterment of both the self and the surrounding. 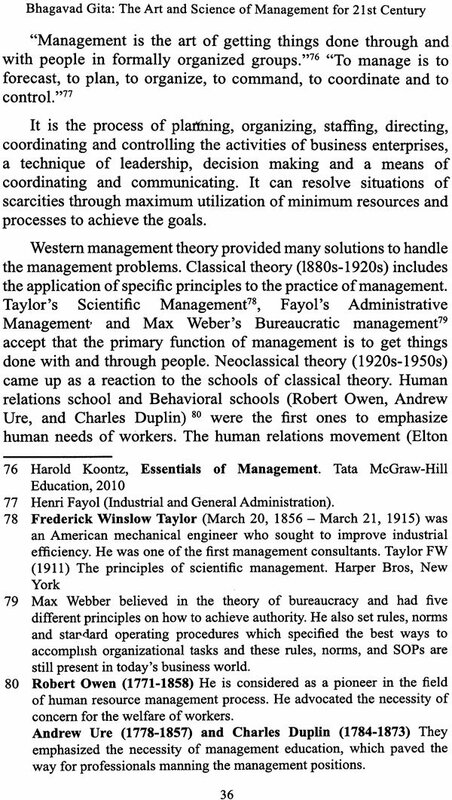 Have you ever wondered how an ancient text holds within its sacred teachings, all the managerial principles that are needed to make it big in todays world? If you have seen the Bhagavad Gita only as a religious book, now is the time to change perspectives. Lord Krishna in his attempt to guide Arjuna in the battlefield serves as the ultimate management guru - the one you've always been searching for! Learn from the words of the Lord the tricks to transform your weaknesses into your strengths. Immerse yourself in the book's enchanting journey that demystifies the Bhagavad Gita and tells us that it is relevant even today. The book Bhagavad Gita: The Art And Science of Management for 21st Century' brings out the wisdom from the Bhagavad Gita to throw light on Lord Krishna's message of Wishkama Karma' (Selfless Action). This work on the Bhagavad Gita is characterized by a purpose. I have endeavored to relate the Bhagavad Gita to Modern Management. 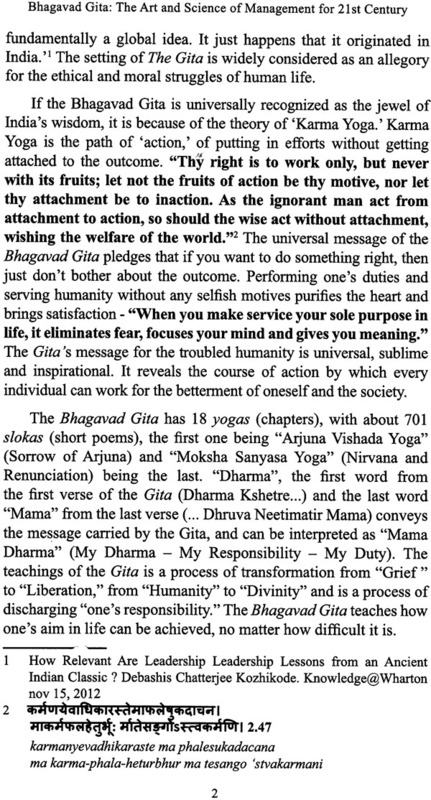 The Gita, a guide to the science of self-realization, also teaches us managerial techniques that lead to a blissful state of affairs as against conflicts, tension, depression, restlessness, despair and dejection, low efficiency, the absence of motivation and lack of work culture common to most of the enterprises today. The management concepts like vision, leadership, decision making, planning, communicating, coordinating motivating excellence in work, achieving goals, attitude towards work, nature of the individual, and so forth, are all discussed in the Bhagavad Gita with a sharp insight making it highly suitable for the modern management. 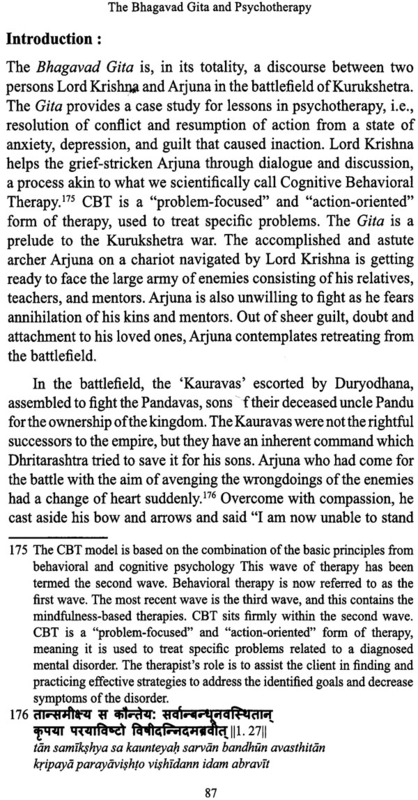 It may be noted that while the Western design on management deals with the problems at material and external levels, the ideas contained in the Bhagavad Gita tackle the issues from the grass root level of human thinking because once the basic thinking process of man is improved, it will automatically enhance the quality of his actions and their results. Lord Krishna outlines, through hit, Gita-discourse, a new way of life —dealing with work ethics, management strategies, leadership skills, self-development, personality development, motivational tactics, getting rid of stress, the welfare of all, and achieving the ultimate freedom. The Bhagavad Gita addresses dilemmas of the young and provides solutions for handling the challenges. Arjuna represents the modern youth, and Krishna's psychological treatment resolves distress, conflict, fear and anger from Arjuna's mind. The Gita's management apparatus provides greater perspective on modern management. Bhagavad Gita is a dialogue between Lord Krishna, the Divine Incarnate, and Arjuna, the representative of mankind on the battlefield of Kurukshetra around five thousand years ago. Though Arjuna was eager to fight the battle, when he saw that he had to fight against his dear ones, he became nervous and began questioning about war. Arjuna confessed to Lord Krishna his weakness and lack of mental preparedness. Thus begins the dialogue and the Gita is the result. Lord Krishna counsels and encourages Arjuna to fight the righteous war. The despondent position of Arjuna in the first chapter of the Gita is a typical human situation which may come in the life of all men of action some time or other. Lord Krishna, by the sheer power of his inspiring words, raised Arjuna from the state of apathy to the state of righteous action, from the state of inconstancy to the state of self-confidence to achieve the ultimate victory of Dharma (ethical action). The question arises as to why search for leadership skills and management insights in the Bhagavad Gita? The answer to this query lies here. Currently, the mind of people is very restless; desires have increased, the world is at the crossroad facing turmoil - it is torn by tension and anxiety. Challenges like corruption, violence, greed, people manipulating, dirty politics, unhealthy lifestyle, and dilemmas of the youth are seen everywhere. People have become opportunistic and have little or no adherence to principles. If the western thought of prosperity could not provide enough motivation to ensure the betterment of individual life, then the Bhagavad Gita is here to inspire and restore to life, the true spirit of selfless action. Work done without expectation of any outcome tends to purify one's mind and teaches an individual to face problems and become an active decision-maker. The Bhagavad Gita restores to life the true spirit of righteousness and also shows the world of management iiow to steer their organization in tough times and bounce back even more powerfully. It assures all kinds of required leadership in management and wisdom which helps people to handle today's corporate culture. The Bhagavad Gita defines the way one should perform one's work. Gita endeavors to remind us of our duties to the society and the country to which we belong. One should know when to speak, what to speak, and how to speak. One may be powerful enough, yet one should know when to use his / her power. In this context, the transitory nature of the events of the world has to be realized. The Bhagavad Gita in Chapter 2, Verse 14 sheds light on this; the transient appearance of happiness and distress, and their disappearance in due course are like the appearance and disappearance of winter and summer seasons. They arise from a sense of perception. Lord Krishna' said to Arjuna '0 son of Kunti, the contact between the senses and the sense objects give rise to fleeting perceptions of happiness and distress. These are non-permanent, and come and go like the winter and summer seasons...' It is true for self-development. The key message is that leaders, managers, and bureaucrats should master the impulses or emotions that cloud sound judgment. Good leaders, managers, and corporate should be selfless and should focus on their duty rather than obsessing over outcomes or financial gain. In the Bhagavad Gita, Lord Krishna acted as a role model and imparted great lessons of leadership to Arjuna. The relevance of the Gita in today's fast-paced world cannot be denied. The wisdom of the Gita is going global and is relevant even after 5200 years. The real test of knowledge and wisdom is to remain unmoved, definite and certain in uncertain, troubled, volatile, violent and turbulent times. Be active, decisive and risk-taking for constant development and better governance. Self-governance must be there like self-realization. The Gita can transform your life. We are slowly and gradually being controlled consumed and swallowed by our senses only to become victims of these. We must learn to control our senses and direct them towards the right path. Whether it is a corporate world or an individual's world, the Gita's lessons apply to one and all from all walks of life, in all times across the globe. A proper study of The Bhagavad Gita will make us realize that we must discover within ourselves endless energy, hope, and inspiration to achieve our goals. The present is what we have right now, and our future is what we will eventually create from what we have. I want to make it very clear that I am not going to discuss anything spiritual or religious in my work. The purpose of this book is to relate the Western model of efficiency and excellence to India's attitude to them, dating back to thousands of years. The book describes the challenges like restlessness, despair, dejection, and confusion faced by the youth, leaders, executives and individuals and how they are all depicted in Arjuna. 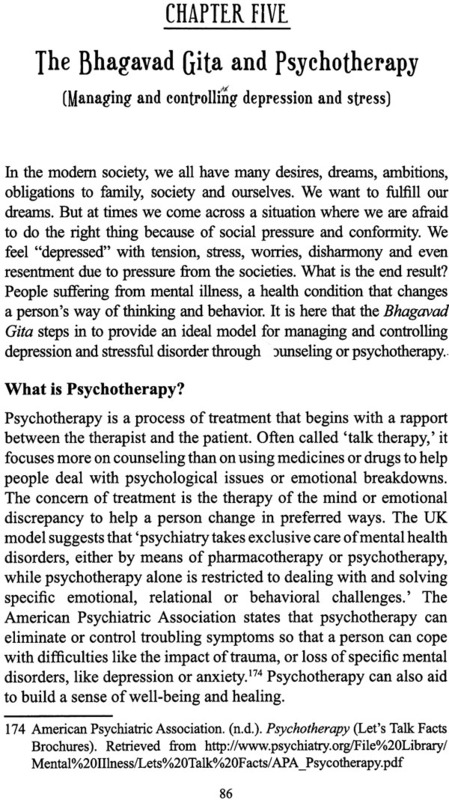 It also offers solutions to their problems described in Lord Krishna's psychological treatment of Arjuna. The book Bhagavad Gita: The Art and Science of Management for 21st Century ' weaves together the threads of wisdom from the Gita to shed light on contemporary issues and challenges for leaders, managers, and corporate at all levels. 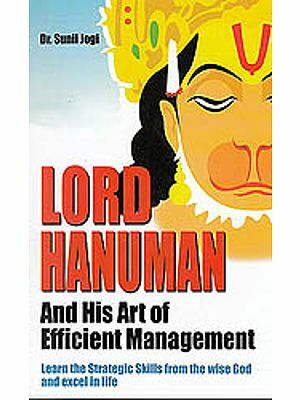 It explores the leadership lessons, management strategies, motivational skills, tools of personality development and psychotherapeutic techniques in the Bhagavad Gita and helps the managers arid leaders to apply them to modem business life. I have endeavored to relate the wisdom of the Bhagavad Gita to modem management scenario and bring out its usefulness in the corporate world.